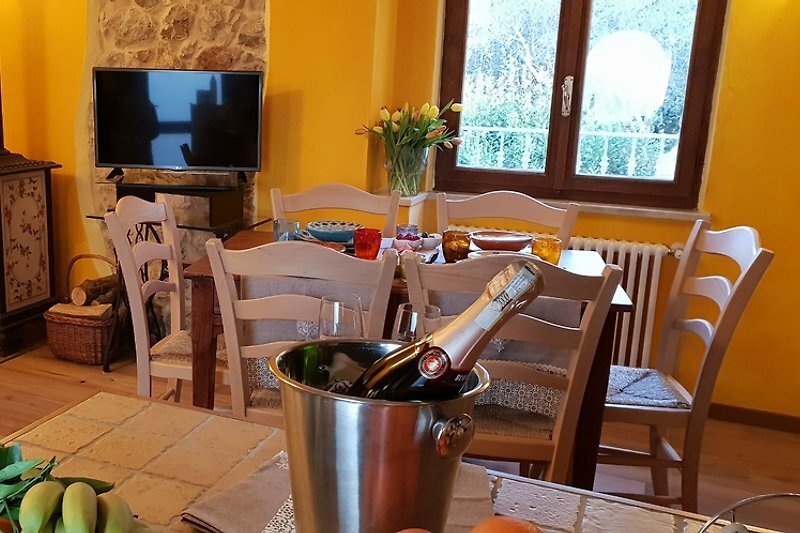 Beautiful holiday apartment in the old town of Cassone, in a quiet and green area, with lake view, garden and parking place. 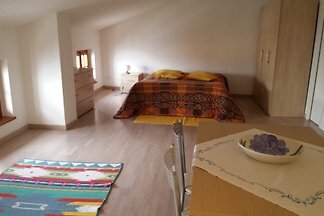 The apartment is perfect for couples and families with two children. It is only 50 m from the lake and can also be reached by car through a small lane. The apartment is in a typical mediterranean complex, with stone walls and parquet flooring, which is equipped with a rustic, colorful and warm style. The typical Italian fitted kitchen made of wood has a wooden table, induction hob, refrigerator, dishwasher, oven, moka, kettle, TV SAT with German transmitter available. There are two bedrooms: a double room and a room ideal for children with a bunk bed, both with lake views. The apartment has a beautiful garden (600 mq) with a table, ideal for breakfast buffet and dinner in the open air, hammock and sun chairs for relaxation, barbeque to grill. 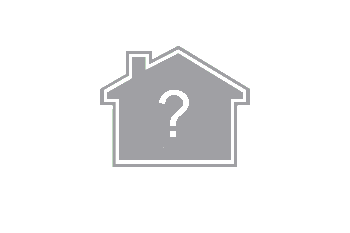 The price includes WLAN and parking for car/bikes/motorcycles in the private garden. Possible additional costs: the use of the laundry (40 €), the additional parking possibility at the bottom of the public parking - for groups with large cars it is difficult to reach the private parking of the apartment (30 € for a week/40 € for long stays), the heating on request in low season (5 € a day). 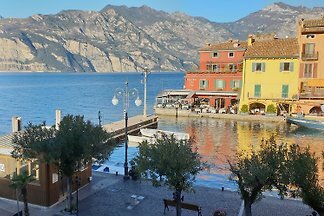 The apartment is located in the old town of Cassone, a beautiful village 4 km from the centre of Malcesine. The apartment is situated on a typical cobblestone street, close to the beach and the mountain. The centre of Malcesine can be reached by a shuttle service "Tourist Bus" every hour. This is situated in a green area, with a beautiful view of the lake. Wi-Fi, linen, tourist tax and private parking included in the price. Possible extra costs: heating on request in low season (5 € per day), additional parking with card at the public car park at 50 meters - for groups with large cars or difficulty in reaching the private car park in the historic center (5 € per day), laundry access (40 €), change of linen on request. The apartment is furnished in a rustic and colorful style, with lake view and garden. This is ideal for married couples and families to enjoy a relaxing holiday in nature and on the lake but also for an active sports holiday. In the vicinity there are many possibilities for cycling and hiking. 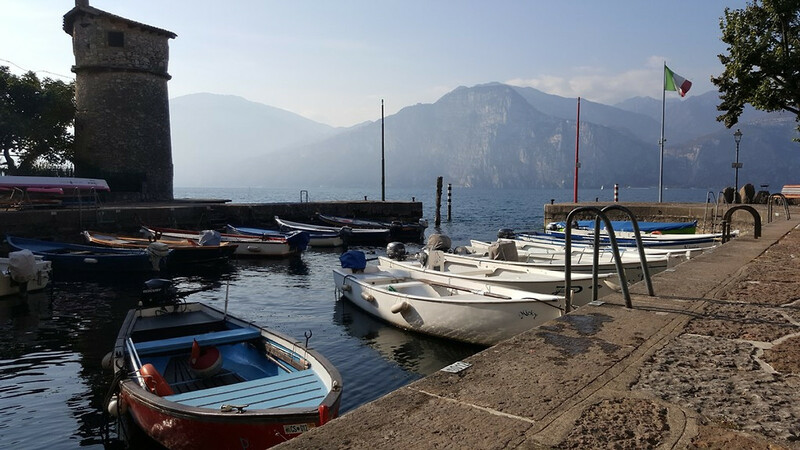 My name is Silvia, I am 30 years old, I speak: English, German, French and Spanish, I have been working in the tourism sector for 12 years and I live in Cassone on Lake Garda with my family.